Owner Roxanne Stark has lived in Myrtle Beach for 22 years. After Suffering from a medical condition called alopecia she began looking for solutions, she was a red head her entire life but could not find red wigs. It was then that she decided to open a wig shop and dedicate herself to helping other women with similar stories. This is all about “Women helping other women” Roxanne has always believed that if you love what you do, it will never be work. Today The Wig Boutique offers a large selection of wigs, and “Red” is one of their #1 Sellers. 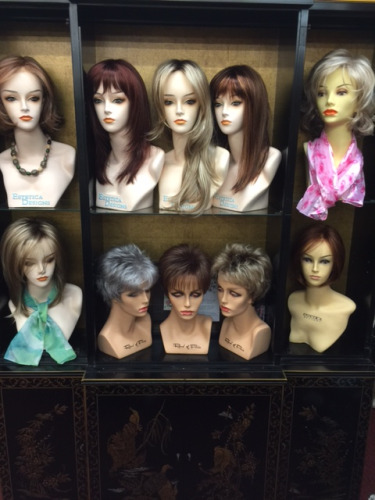 Her customers come from all walks of life, some choosing wigs due to a medical issues, or hair loss from medications. Many over 65% of her clients wear wigs because they can! How fun is it to be able to change your look anytime you wish. Short to long, and vice versa? 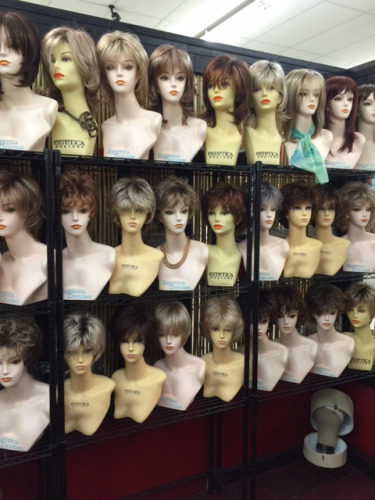 Many women are finding the convenience of wigs the reason they have more than one. Not having to spend hours getting your hair “just right” with a wig your hair looks amazing every time! Buying a wig is nothing to leave to chance, just as important as purchasing the wig that best suited to you is also working with an expert that will fit you properly. After all, you may like the convenience of wearing a wig, but no one really wants everyone to know you have one on. The Clients of the Wig Boutique love to see the before and after photo’s many saying they look, ten years younger. All agree the choice of working with Wig Boutique was the right one. Roxanne Stark continues her education by getting re-certified every year, by attending a re certification class on newest trends, products and styles. We are located inside the Everything Under The Sun Flea Market, Please Call for a private appointment 9am-6pm! I enjoyed the attention. I posted a photo of myself on Facebook. Then I removed my hair, put it in a box and went to bed. 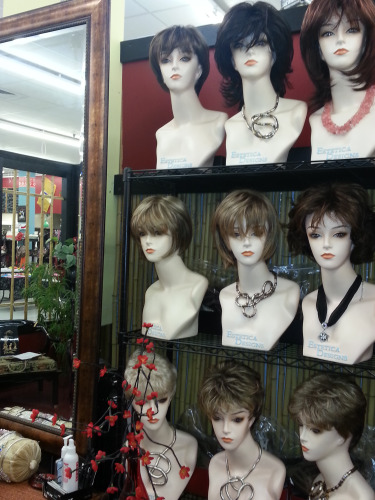 I purchased several wigs at this shop and was only now inspired to write a review after reading the others on thos site. The owner: she is very well-intentioned but I can see how some of the reviewers have taken offense by her Mannerism. While she wants to be helpful she can get carried away in her own story and forget what brought you there. The products: wigs can be used for fun or for a medical condition. I have a medical condition. I have been wearing wigs now for almost 3 years and my biggest problem with this shop is that the wigs do not have labels. I dont know what I am buying and if asked the owner will tend to say "I cant remember" or "I will have to look it up" and then never does. I understand that she doesn&apos;t want to be used as a shop for people to try on wigs and then buy them online but the lack of tags makes me uncomfortable. If you just want to buy a wig because you want the convenience or an easy hairdo, this is a great place to shop. If you are suffering from a medical condition or are an avid wig wearer and don&apos;t want the lecture maybe a more professional shop would suit you. I love this boutique....It was private and comfortable for my wig fitting..
It&apos;s a shame that some people are put off by Roxanne&apos;s honesty and candor when they first meet her...because there is a real gem hidden here at her store...and the gem is Roxanne! She has the ability to know what "works" for you and can move you out of your comfort zone, step by step, showing you how fabulous you can be! Roxanne spent over an hour with me, turning away other customers, so that she could focus on me! She is serious about her business...this is not the place to play and try on haircuts. I suggest you call and make an appointment, plan to be there for an hour, relax, sit back, and let Roxanne do her magic to help you be the best you can be! The woman running this shop the day I went there was absolutely the rudest sales person I have ever dealt with, very condescending she was judging me that I could not afford their cheap product. The only reason why I rated this business one star is because there wasn&apos;t a way to leave less than that. My mother is a 69 year old cancer patient who is in need of a wig from chemo. She is a Christian lady who never has a harsh word for anyone. She visited this business with the intent of picking out a suitable wig and was excited to have her "hair back" but she said that the owner of the business was so very rude to her and kept telling her what she thought was good for her and when my poor mom tried to let her know what she was interested in, she said the lady very sternly told her that she ( my mom) didn&apos;t know what she needed because she wasn&apos;t a " Wig person" among other snarky remarks directed at my mother. My mom was so offended by her treatment that she left without purchasing anything and said she would never go back. I hope this owner realizes that not only did she lose a customer but I will make sure I let everyone know just how she treated my sweet mom and be sure to send them to someone who appreciates a customer and respects what these brave women are battling. You will look 10 years younger! Having spent a couple of days @ the Wig Boutique I was constantly amazed by two things....1. I was not able to tell the wigs from natural hair, except that some of the styles looked a bit better and 2. Everyone I saw after fitting for a wig really did look at least 10 years younger! What a great place to go if you are in the market, the owner will make you feel so comfortable! Handicapped parking is available at our business. Doors allow for the passage of wheelchairs. This location provides wheelchair seating. We turn computers and equipment off at night to save energy. Our business uses compact fluorescent light bulbs, which use less electricity than traditional incandescent bulbs. We take advantage of our monitor’s energy saving display settings.